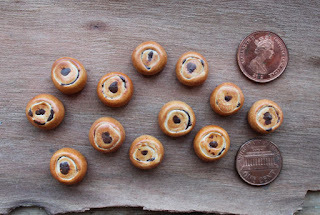 Medieval Morsels: Great British Pastry baking - at 12th scale of course! Great British Pastry baking - at 12th scale of course! The UK is in the grip of the Great British Bake-Off! The final, with three contestants, airs this week. For the first time ever, there was an historic theme during the series. Namely, a Victorian bake week which aired a few weeks ago. The six surviving bakers were asked to make a decorated, "raised" game pie. A raised pie is one where the pastry sides are raised up to enclose deep contents. Early pie makers had to raise their pies entirely by hand. Easily moulded hot water pie-crust had been used since medieval times by the best "pastillers" or pastry chefs. But it was the invention of the sprung metal pie form or mould, which later came to give the pastry sides of the pie support. This allowed a finer pastry to be used and elaborate decoration incorporated. Back to the Bake-Off and one contestant, fire fighter Matt, had even managed to source an authentic pie tin dating from 1850. He made a good game pie, but this did not prevent him from going out that very week. MedievalMorsels makes quite a few raised table and smaller pies. But, inspired by Bake-Off, it has added a Victorian raised game pie to its range too! In her book “Food in History” Reay Tannahill noted that a mixture of wheat and rye (maslin) flour was found to be best for pastry making - neither giving too soft a dough (as rye did) or too brittle a dough (as wheat did). The wheat with rye mixed flour made it possible to mould either a simple, or a highly ornate pie crust. In Medieval Northern Europe the usual cooking fats were lard and butter. Lard made a stiff pastry and allowed a solid, upright case or pastry coffin to be formed. Et voila! the “raised” pie-crust container, ready for its filling! No medieval cookery books gave detailed instructions on pastry making, this knowledge was assumed to be passed on by Medieval cooks. According to the food historian Peter Brears the pastry dough would have been mixed, kneaded and shaped as empty crusts - large and small - on the work-table, and then briefly dried off or hardened in the ovens. For custards and the like, the fillings would be poured into the empty shells whilst still inside the oven. But for most other recipes they were returned to the work-table, filled with a cooked filling, any lids set in place, then put back in the oven for perhaps only 20 to 40 minutes. Crusts and fillings could all be prepared in advance, then quickly baked immediately before they were required. Just like the ‘blind baking’ technique we use today.